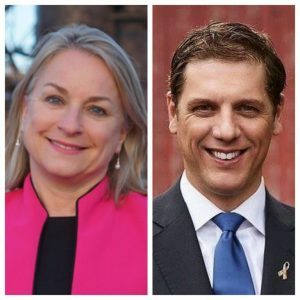 In the race for the open seat in the newly drawn 7th District, Democrat Susan Wild leads Republican Marty Nothstein by 6 points among potential voters, while the Democrat leads by just 2 points in the standard model in a new Monmouth University Poll. The poll conducted by telephone from September 5 to 9 with “all potential voters” shows Wild leading Nothstein 46-40, with 3% going to the Libertarian candidate Tim Silfies, and 11% undecided. These voters have participated in an election since 2010 or have newly registered to vote (a group that represents about 84% of all registered voters in the district). However, this is the first Monmouth poll out of ten competitive House races they’ve polled thus far in which the Republican candidate’s chances improve when using the “standard likely voter” model. Wild leads Nothstein 47-45 in the standard midterm model, while Silfies brings in 2% and 7% remain undecided. In the “Democratic Surge” model, Wild is ahead of Nothstein 48-44, with Silfies at 2% and 7% undecided. “These margins, however, are not statistically significant for any of these scenarios,” the article states explaining the numbers. The newly drawn 7th district encompasses mostly the old 15th district (70%), the seat vacated by Rep. Charlie Dent (R-Lehigh). The rest of the district is made up of the current 17th District represented by Rep. Matt Cartwright (D-Lackawanna) and 10th District represented by Rep. Tom Marino (R-Lycoming). Wild leads Nothstein 47-39 among potential voters in the part of the old 15th District, while the gap shrinks to 46-43 in Wild’s favor in the parts of the district from the old 17th and 10th Districts. In contrast from all other Monmouth polls this year, this is the only race in which the Republican candidate’s voters are more enthusiastic than the Democratic candidate’s voters. 66% of Nothstein voters have expressed a lot of interest in the race, while 62% of Wild’s voters are enthusiastic. Right now, 55% of PA7 voters express a lot of interest in the congressional race. As the case in many congressional races, President Trump will be a factor in voters going to the polls. Trump has a 47% approval rating in the 7th District, while 49% disapprove and 4% saying they don’t know. The gaps significantly widen when looking at stronger feelings, 41% strongly disapprove of Trump, while 29% strongly approve of the President’s job performance. For Trump’s most significant piece of legislation passed, the tax reform plan, 42% of voters approve of the bill, while 41% disapprove. The Democrats grab a slight edge in who the voters of the 7th district want to see control Congress, 41-38 over the Republicans, with 20% saying the party controlling Congress doesn’t matter to them. The new 7th District supported President Obama in 2012 for president by 7 points, while Sec. Hillary Clinton won the district by just over 1 point. The votes for Congressional votes in 2016 went 9 points for the Republican candidates, while in 2012 it went for the Republican by just 3 points. Dent did not have a Democratic challenger in 2014 for the 15th District. Health care (30%) and immigration (21%) are the two most important issues to the voters in the district out of six policy areas including job creation (14%), gun control (13%), tax policy (9%), and abortion (5%). Wild supporters selected health care as their most important issue at 41%, while immigration finished 1st for Nothstein supporters at 33%. The last question on the survey polled voters if they were aware about Nothstein being investigated for a “possible incident of sexual misconduct from some years ago.” The investigation into allegations by SafeSport was closed. 45% of the voters said they have seen or heard the news, while 55% were not aware. With less than 2 months until the Election, most of the voters polled currently share “no opinion” of either candidate when asked about favorability. Nothstein has a 26% favorability rating, with 15% viewing him unfavorably, and 59% having no opinion. Wild holds a 30% favorability rating, while 13% view her unfavorably, and 57% share no opinion. METHODOLOGY: The Monmouth University Poll was sponsored and conducted by the Monmouth University Polling Institute from September 5 to September 9, 2018 with a random sample of 401 potential voters in Pennsylvania’s 7th Congressional District, drawn from a list of registered voters who voted in at least one of the last four general or primary elections or have registered to vote since January 2016. This includes 220 contacted by a live interviewer on a landline telephone and 181 contacted by a live interviewer on a cell phone. Monmouth is responsible for all aspects of the survey design, data weighting and analysis. Final sample is weighted for region, party registration, age, gender, education and race based on state voter registration list and U.S. Census information. Data collection support provided by Braun Research (field) and L2 (voter sample). For results based on this sample, one can say with 95% confidence that the error attributable to sampling has a maximum margin of plus or minus 4.9 percentage points (unadjusted for sample design). Sampling error can be larger for sub-groups (see table below). In addition to sampling error, one should bear in mind that question wording and practical difficulties in conducting surveys can introduce error or bias into the findings of opinion polls. The new 7 is now a 50/50 seat. The party who has the momentum will take the seat but it will go back and forth. This isn’t the old 15 anymore which was reliably GOP. I suspect the D’s will take this by 3 or so this time. Looking at the raw data of who they got on the phone they had over 60 white women over the age of 65. It will be interesting to see where the actual numbers come out but it seems that Wild had a sample advantage. With the weakness of Nothstein and the lackluster interest in Wild, Silfies seems like a (highly qualified) underdog with a shot. Wild lead is a low ball number and is going to be higher. This is not a rock solid red district and has more socially tolerant undertones which is helpful to Dems. This is a Dem victory seat this cycle.